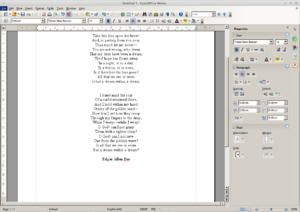 Apache OpenOffice (AOO) is an open-source office productivity software suite. It is one of the successor projects of OpenOffice.org and the designated successor of IBM Lotus Symphony. Apache OpenOffice is a close cousin of LibreOffice and NeoOffice. It contains a word processor (Writer), a spreadsheet (Calc), a presentation application (Impress), a drawing application (Draw), a formula editor (Math), and a database management application (Base). Apache OpenOffice's default file format is the OpenDocument Format (ODF), an ISO/IEC standard. It can also read and write a wide variety of other file formats, with particular attention to those from Microsoft Office (although unlike LibreOffice, it cannot save Microsoft's newer XML formats like DOCX, only import them). Apache OpenOffice is developed for Linux, macOS and Windows, with ports to other operating systems. It is distributed under the Apache License. The first release was version 3.4.0, on 8 May 2012. In January 2015 the project reported a lack of active developers and code contributions. After ongoing problems with unfixed security vulnerabilities through 2015 and 2016, in September 2016 the project started discussions on possibly retiring AOO. The current version, 4.1.3, is known to include undisclosed security issues. Despite the problems with development, the software continues to attract a large number of downloads, approximately 100,000 per day, a similar number to that of LibreOffice. In April 2011 Oracle stopped development of OpenOffice.org and laid off the remaining development team. Its reasons for doing so were not disclosed; some speculate that it was due to the loss of mindshare with much of the community moving to LibreOffice while others suggest it was a commercial decision. In June 2011 Oracle contributed the OpenOffice.org trademarks and source code to the Apache Software Foundation, which Apache re-licensed under the Apache License. IBM, to whom Oracle had contractual obligations concerning the code, appears to have preferred that OpenOffice.org be spun out to the Apache Software Foundation above other options or being abandoned by Oracle. Additionally, in March 2012, in the context of donating IBM Lotus Symphony to the Apache OpenOffice project, IBM expressed a preference for permissive licenses, such as the Apache license, over copyleft license. The developer pool for the Apache project was seeded by IBM employees, who, from project inception through to 2015, did the majority of the development. Base A database management program analogous to Microsoft Access. Base can function as a front-end to a number of different database systems, including Access databases (JET), ODBC data sources and MySQL/PostgreSQL. Native to the suite is a version of HSQL. Apache OpenOffice includes OpenOffice Basic, a programming language similar to Microsoft Visual Basic for Applications (VBA). Apache OpenOffice has some Microsoft VBA macro support. OpenOffice Basic is available in Writer, Calc and Base. Apache OpenOffice inherits its handling of file formats from OpenOffice.org, excluding some which were supported only by copyleft libraries, such as WordPerfect support. There is no definitive list of what formats the program supports other than the program's behaviour. Notable claimed improvements in file format handling in 4.0 include improved interoperability with Office Open XML, although it cannot write Microsoft's newer XML formats like DOCX, only read. Apache OpenOffice does not "release early, release often"; it eschews time-based release schedules, releasing only "when it is ready". This contrasts with the approach of LibreOffice, which puts out feature releases roughly every six months and bug-fix updates twice a month. Apache OpenOffice has lost its initial developer participation. During March 2014–March 2015 it had only sixteen developers; the top four (by changesets) were IBM employees, and IBM had ceased official participation by the release of 4.1.1. In January 2015, the project reported that it was struggling to attract new volunteers because of a lack of mentoring and badly in need of contributions from experienced developers. Industry analysts noted the project's inactivity, describing it as "all but stalled" and "dying" and noting its inability to maintain OpenOffice infrastructure or security. Red Hat developer Christian Schaller sent an open letter to the Apache Software Foundation in August 2015 asking them to direct Apache OpenOffice users towards LibreOffice "for the sake of open source and free software", which was widely covered and echoed by others. 4.1.3 is also known to have security issues, but 4.1.4 is delayed by an absent release manager. The Apache Software Foundation January 2017 minutes were edited after publication to remove mention of the security issue. Oracle had improved Draw (added SVG), Writer (added ODF 1.2) and Calc in the OpenOffice.org 3.4 beta release, though cancelling the project only a few days later. Version 4.1 was released in April 2014. Various features lined up for 4.1 include comments on text ranges, IAccessible2, in-place editing of Input Fields, interactive cropping, importing pictures from files and other improvements. 4.1.1 (released 14 August 2014) fixed critical issues in 4.1. 4.1.2 (released in October 2015) was a bugfix release, with improvements in packaging and removal of the HWP file format support associated with the vulnerability CVE-2015-1774. 4.1.3 (September 2016) had updates to the existing language dictionaries, enhanced build tools for AOO developers, a bug fix for databases on macOS, and a security fix for vulnerability CVE-2016-1513. 4.1.4 will contain security fixes; it was scheduled for Q1 2017, but as of April 2017[update] the release is still in development. As of May 2012 (the first million downloads), 87% of downloads via SourceForge were for Windows, 11% for Mac OS X and 2% for Linux; statistics in the first 50 million downloads remained consistent, at 88% Windows, 10% Mac OS X, 2% Linux. Derivatives include AndrOpen Office, a port for Android. LibreOffice also takes some changes from Apache OpenOffice. In 2013, 4.5% of new commits in LibreOffice 4.1 came from Apache contributors; in 2016, only 11 commits from Apache OpenOffice were merged into LibreOffice, representing 0.07% of LibreOffice's commits for the period. LibreOffice earlier rebased its LGPLv3 codebase on the Apache OpenOffice 3.4 source code (though it used MPL v2, not the Apache Licence) to allow wider (but still copyleft) licensing under MPL v2+ and LGPL v3+. Older versions of NeoOffice included stability fixes from Apache OpenOffice, though for NeoOffice 2017 it was rebased on LibreOffice 4.4. ^ "Announcing Apache OpenOffice 4.1.3". The Apache OpenOffice Blog. Apache Software Foundation. 12 October 2016. ^ "Apache OpenOffice – Browse /4.1.3/binaries/en-US/". Sourceforge.net. Retrieved 13 October 2016. ^ Weir, Rob (29 April 2014). "The Apache OpenOffice project announce the release of Apache OpenOffice 4.1". Apache OpenOffice blog. Apache Software Foundation. Retrieved 29 April 2014. ^ Edge, Jake (27 July 2016). "Apache OpenOffice and CVE-2016-1513". [LWN.net]]. Retrieved 4 August 2016. ^ a b "Contemplating the possible retirement of Apache OpenOffice". LWN.net. 2 September 2016. ^ a b "Apache diskutiert über Ende von OpenOffice". Heise.de (in German). 2 September 2016. ^ a b Bantle, Ulrich (2 September 2016). "Apache denkt über Ende von Openoffice nach » Linux-Magazin". Linux-Magazin (in German). Retrieved 2 September 2016. ^ a b "Over 200 million downloads of Apache OpenOffice". The Apache Software Foundation. 28 November 2016. ^ Stahie, Silviu (30 November 2015). "LibreOffice Now Has More than 100 Million Active Users". Softpedia. Retrieved 4 December 2016. ^ a b c Corbet, Jonathan (25 March 2015). "Development activity in LibreOffice and OpenOffice". LWN.net. Retrieved 3 April 2015. ^ "Release Plan". LibreOffice Wiki. The Document Foundation. Retrieved 3 August 2014. ^ a b c "Board of Directors Meeting Minutes". Apache Foundation. 18 January 2017. Archived from the original on 18 April 2017. Retrieved 18 April 2017. There will be at least one security fix in the under-development release 4.1.4. ^ "AOO 3.4 Release Notes". ^ "app-office/openoffice-bin: Apache OpenOffice productivity suite.". Gentoo Linux. Retrieved 27 June 2013. This page was last edited on 7 July 2017, at 21:53.